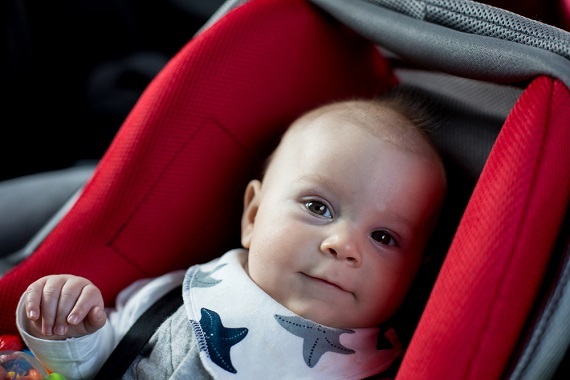 Children’s car safety seats: Are you using yours correctly? Motor vehicle accidents are the number one cause of death in children, and forty percent of children killed in automobile crashes were unrestrained. Correctly using a child’s car safety seat can reduce the risk of fatal injury by more than half. The child safety group Safe Kids Worldwide offers free children’s car seat checks. Look at their website to see if they’re sponsoring an event near you. If there are no safety checks nearby, Safe Kids Worldwide also offers a list of technicians qualified to check that your children’s car safety seat is properly installed and that you’re using it right. Don’t forget the top tether. All children’s car seats have at least three anchor straps. Some have five. It’s easy to forget that important top strap. Check the expiration date. Like all good things, children’s car seats won’t last forever. Wear and tear, exposure to heat and UV light — all these things take their toll. Most convertible car seats are good for 10 years; most infant seats for 6. Check your warranty card to see when yours expires. Been in a wreck? Throw it out. A damaged car seat is an ineffective car seat. If you’ve been in a serious accident while your child’s car seat was in the car with you, maybe toss it and get a new one. And finally, some good news: more expensive doesn’t always mean better. All children’s car safety seats have to meet the same federal standards. They’re tested by the NHTSA to make sure that all models on the market conform to those guidelines. Some models may be more convenient, more versatile, better looking, or have a better cup holder – but they’re still providing the same baseline safety features. So keep these tips in mind, do your homework, and before you take a spin, strap ‘em in! This video clip contains all the essentials for tire safety in just over a minute and a half — take a look. .
Tirewise is your one-stop shop when it comes to tire safety and consumer protection. (It’s a part of safercar.gov). Here are just a few of the useful resources. How to learn the age of your tires – Regardless of tire wear, the rubber can break down over time. Some vehicle and tire manufacturers recommend replacing tires that are six to 10 years old, regardless of treadwear. Check out the diagram on this page to see how to date your tires. Tire Rating Lookup – You can search for recalls, investigations and complaints on tires — and also for child safety seats, for auto equipment, or for your entire car. Check for tire recalls – NHTSA has rated more than 2,400 lines of tires, including most used on passenger cars, minivans, SUVs and light pickup trucks. Consumers can select a tire brand from the drop-down menu below. One other important safety notice: Make sure your auto insurance is current and provides adequate coverage. If you live in New England, find one of our member local agents near you. How good do you feel about your car’s safety? You can check out the Insurance Institute for Highway Safety’s lists of the 2014 Top Safety Picks to see if your car makes the grade. If you are in the market for a new car, it’s particularly handy information. Twenty-two vehicles earned the highest safety awards thanks to a high level of protection in crashes and the availability of front crash prevention technology to avoid many collisions in the first place. Another 17 makes earned awards by meeting the crashworthiness criteria alone. In addition to the listings, the linked release (above) offers some good information on how these awards were determined – but to really get a sense of their testing and rigorous standards, check out this short video that shows some of the testing in action.